Performance 2.0 Storage Cabinets in Blue (10-Piece Set) Get your power tools, seasonal decorations, gardening supplies and more organized with the Performance 2.0 Series cabinet system. With durable 24-gauge steel frames and strong double-walled doors, these cabinets are built to last, and they're fully-lockable, so you can rest easy knowing your valuables are safe.Easy-to-grab stainless steel handles give quick access to your items, and a frameless door design provides a clean, contemporary look to your space, with height-adjustable legs to accommodate for uneven garage floors.Flip-up style doors on the Wall Cabinets allow for a wider opening for retrieving paint supplies, and cleaning items, while adjustable steel shelves in the Locker and Base cabinets give you a customizable storage solution, with plenty of room for all your belongings.Durable steel cabinets, great for any space. With the Performance 2.0 Series Garage Cabinets, your home just got a lot more functional. 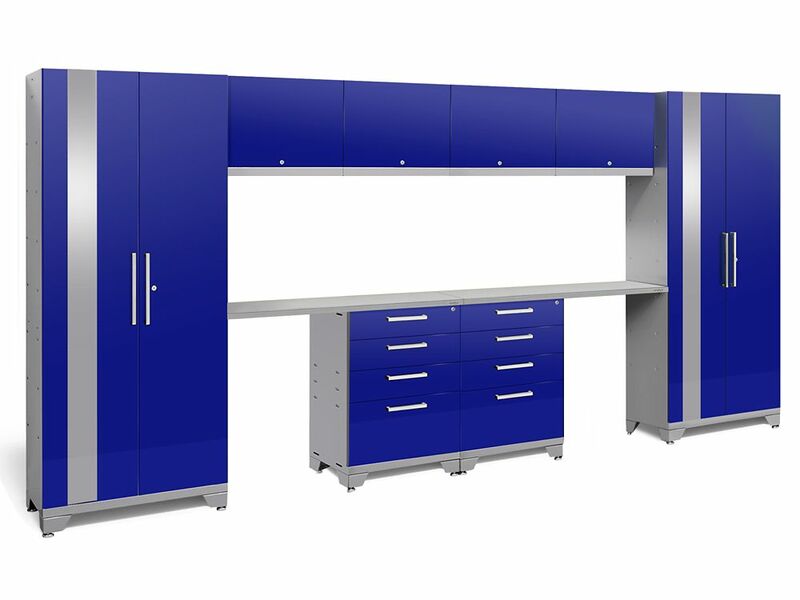 Performance 2.0 Storage Cabinets in Blue (10-Piece Set) is rated 4.3 out of 5 by 4. Rated 5 out of 5 by Tm from Great addition to the garage. Well built, easy to install. Great addition to the garage. Well built, easy to install. Rated 3 out of 5 by WarDawg24 from This garage system is the budget friendly version of some of the higher-end systems out there. Th... This garage system is the budget friendly version of some of the higher-end systems out there. The quality of the system is amazing. The kit comes assembled for the most part. All you have to put on are the handles, logo and inset the drawers in place. The specs are precise. I have not had a single screw or bolt that did not work. Price: Very fair price for the quality, functionality and build. Shipping & Delivery: The product arrived a lot sooner than I had expected. This was because of direct communication with the vendor and not Home Depot. The delivery is contracted out but the guys were very professional and took good care of the delivery. Packaging: These products are packaged really well. The company does take care in sending products to customers in mint condition unlike many other systems I have had shipped from other vendors. Other: I love this system so much, that I wanted to add a few more items to my new unit. You can purchase the cabinets individually from the vendor. However, with my luck, the vendor is "no longer offering individual cabinets in blue this year", whatever that means. It was disappointing that I could not complete my garage. The suggested I buy another kit, but then I would be getting parts I do not need. Rated 5 out of 5 by Joey31 from Awesome product! I love these cabinets! Excellent product! Durable and great look to any garage! Rated 4 out of 5 by Travis from Pretty nice product!... Pretty nice product!